Very very white and beautiful!! Looks fabulous in my sunroom. Spruce up your porch or patio with this lovely International Caravan four-piece settee set. This charming wicker patio set is made from weather-resistant materials to enhance durability. The collection features two chairs, one loveseat and a table, giving you everything needed to create the perfect outdoor living area to entertain guests. Dimensions 44.0 In. X 48.0 In. X 44.0 In. We ordered these for our balcony. They are extremely well-made. They are heavy (a good thing), and very comfortable (even without cushions, which I haven't managed to get yet). I am considering another set. I am very pleased with my purchase of my wicker outdoor settee group. I purchased this settee to go on my front porch which faces the harsh, west sun. After three years of use, it still looks absolutely BRAND NEW! This is what I would describe as an undersized settee; thus, perfect if you are wanting to use it in a tight area. If you are wanting this set to take up a bunch of space that is not going to happen. The colors in this set, if you are looking closely, are a mixture of cocoa and burgundy/brown. From a distance it looks overall, chocolate brown. The bit of variation in color makes it look quite expensive. This is absolutely one of my favorite purchases on Overstock. I also love that I can change pillows on this settee with the seasons. It doesn't matter if I put lime green pillows on it in the summer or burnt orange in the fall.....the pillows are accented beautifully on this color. Also, the weight of these chairs are also impressive. You do not have to worry about the wind blowing them around. In Oklahoma we have horrific thunderstorms and high winds. I have never had to worry about taking this set indoors; I have left all pieces outside and left them subject to rain, snow, hail etc..... again, the entire set still looks BRAND NEW. You will not regret buying this set. Finally, I was really impressed with how well these pieces were packed and shipped. I made sure I was home when this was delivered. I asked the deliverer to wait for me to unpack all the pieces to make sure they arrived safely because some of the boxes were crushed. He was patient and every piece was absolutely perfect. It is so nice to buy something that is built well, looks expensive, functions beautifully for a reasonable price. Within a few days of placing my order, the freight company called and scheduled the delivery between 4:00 & 8:00 p.m.- Perfect. The driver was courteous and assisted me in opening the container. The driver couldn't wait for me to unpack everything; however, he gave me instructions on what to do if I found anything damaged after he left. I got everything out and carried the items from my drive in the front of my house to the backyard in (1) hour, by myself. It did take me longer to cut up the card board to dispose of it. There will be a pallet to dispose of. The chairs and love seat are very comfortable and beautiful (I choose black) and it is steel frame and resin. The birds have baptisted it and I have had to wash it down without any problem. We had 50 mph winds last night and none of the furnture moved. I searched several websites looking for the best deal on an outdoor wicker set for my deck. This was definitely the best price for any set I found. It was delivered well packaged so no damage during shipment. My husband noticed immediately that it was made with a steel construction beneath the resin wicker so it should hold up well. I love the scalloped design on the backs of the settee and chairs. It has the Victorian look I was going for. I am very pleased with this purchase! I recieved my Four-piece PVC Wicker/ Steel Outdoor Settee Group in a very large box which was hard to recycle but was in great shape. I chose the Sage color and find this color to work well outside under my trees. I will need to purchase pillows for the chairs but I am real happy with this purchase. One of the legs of a chair was not wrapped tight and I have had to rewrap it, but it did not detrack from the use of the item. Great Wicker Furniture at a Great Price!! We were very pleased with our purchase from start to finish!! 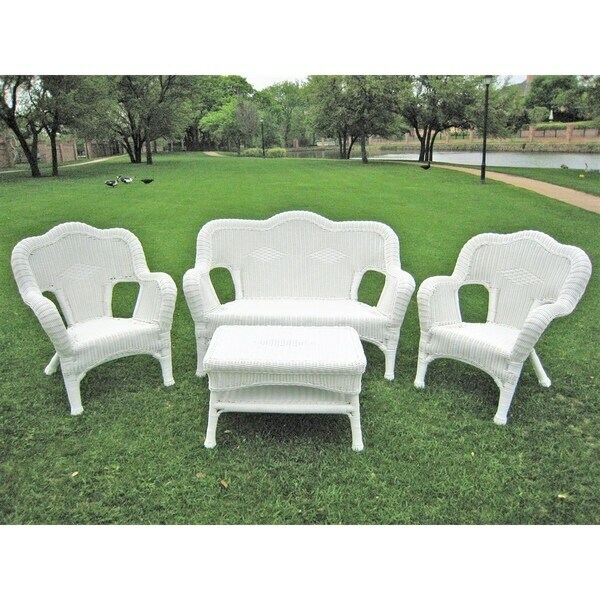 We purchased two sets of this wicker in white for out outside porches. It arrived within 2 weeks the delivery was a delightful experience the driver moved the large boxes to the front porch and he was very helpful. We are happy with the wicker quality it is build to last a long time outdoors. We think it¿s a great set of furniture at a great price!! I was quite surprised at the small size. The seats are not very deep, making it a bit uncomfortable for an adult. The chairs seem to be more comfortable than the love seat. It seems to be durable and is quite heavy. Holds up to wind and sand as I live in the desert. Overall it is a good set and very pretty..
My wicker was delivered well packed. The UPS driver had to park the truck down the road and hand truck it down my street. He was very patient and even helped me unpack it and check it over. It's in perfect condition and is exactly how it's described. I got the antique almond colored loveseat, two chairs and coffee table. It's sturdy and comfortable and makes a great conversation area on my back porch with enough room for a table and chairs and still room to move around. I'm very satisfied with Overstock and will continue to purchase from them. When I read the reviews I decided to buy this set. I wish I could have seen it in person. Its okay, but, not for the money I paid. I have been looking locally and finding things that I like a whole lot better for less money. If I had to do it again, I would not get this set. There are better ones out there for less money. I have had this set for 18 months and it has rusted out in the legs of the couch and 1 chair. It is going to the dump this weekend!!!! Lots of money to pay for furniture that lasted only 18 months. This furniture is very cute, but I have a very large porch and husband and at times it looks like dollhouse furniture. Well constructed. Held up well in outdoor weather for about a year so far. The wicker is a bit glossy, which some may not like (makes it look a bit cheap) but I'm fine with it. Cute design and true to colors in pic. Love this set! I ordered my set in the dark brown color and like how it doesn't show the dirt, is easy to wipe off after a rain, or how it doesn't feel scratchy when sitting on it wearing shorts or skirts because of the wicker being smooth resin. I love my wicker set! I purchased it in black and also bought additional pieces to go with it. This patio furniture is very sturdy and looks very nice on your patio or porch. It was all packaged very good and came in great condition. I would definitely recommend this product. This set is comfy! We bought on sale in the fall, cannot wait for spring to use them! We did pull out the loveseat on those rare sunny fall days to try it out, great product. The wicker chairs and table are perfect for my porch. It fits in so well, The cushions we bought make it even better. I bought it in natural and green. Perfect! Gorgeous set that I've purchased for my back porch and it is very well build, easy to clean and enjoying them 6 years later.... this was a great buy, thank you Overstock! "can i switch out one chair for a rocker chair?" This set can only be sold as you see on site. "Will this set be offered in white?" "What is the height of the seat of the chair? I'm hoping it does not set too low." "Does this set come assembled? If not, how difficult is assembly?" "I purchased this set earlier in the spring. I would like to get a cover for it for the winter. Is there a specific cover that will cover the set? My first choice would be to cover the set, but if not, I'd like the individual size recommendations. What are the measurements? Thank you"
This group set does not have a specific cover. The loveseat measures 36 inches high x 51 inches wide x 19 inches deep, chairs 36 inches high x 29 inches wide x 18.5 inches deep, and table 18.5 inches high x 31 inches wide x 17 inches deep. All measurements are approximate. "wait,mare you saying it is NOT possible to buy the moss green wicker items as I asked in orig question?? thx for suggesting other items, but they don't work...."
We apologize for the confusion we might have caused. The chairs can purchased separately under item #15620190 but the settee is not available separately. I hope this helps. "i would like to buy the moss green wicker furniture, BUT not as the set...dont need table but need four ( vs two) chairs and one settee...may i purchase it like that? on a price per piece basis??" We have the, International Caravan Valencia Resin Wicker/ Steel Frame Double Glider Chair, item 13036314 and the International Caravan PVC Resin/ Steel Frame Outdoor Chair, item 11744150, there is also the International Caravan PVC and Steel Single Square Planter, item 10481547. Please check out the, the International Caravan Outdoor Resin/ Steel Bistro Set, item 1152617.